Layna Pimentel’s New Release and Cover Reveal!! I had good intentions, really I did. I have a new project that I need to get done. So, I signed up for NaNo, worked on my plot, and gathered my thoughts. I warned my family I would be writing all month. I was sittling waiting with file open and ready to begin on 10/31 just before midnight. I would not cheat, I would wait for the stroke of twelve and then begin. I was ready, my characters were ready. This one would be easy. That isn’t exactly what happened. I sat there alone in my living room, all was quiet outside, the droves of kiddies were gone wherever those little hobgobblins go when the witchin’ hour strikes. 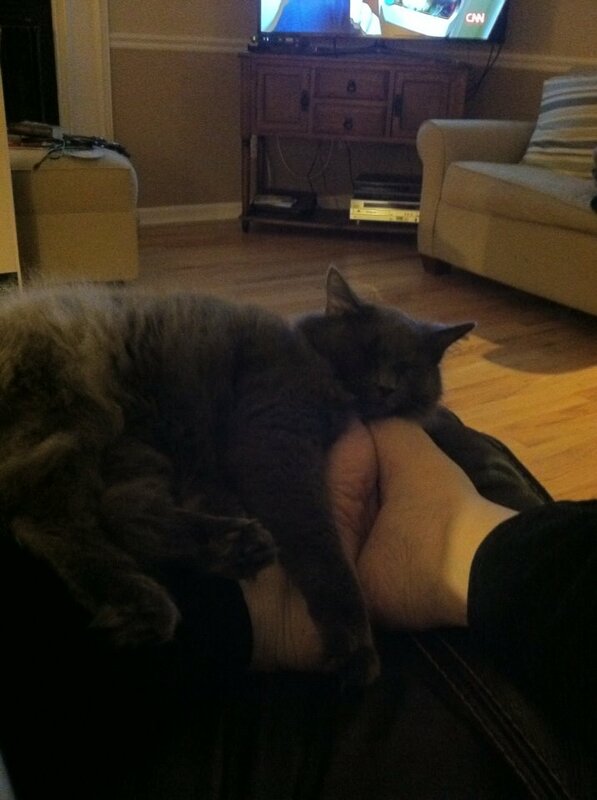 My cat was there to offer her support and serve as foot warmer. Then it happened, I sat with fingers poised above the keys and the next thing I know, I’m waking up with cold feet and a blank page. Yep, I dozed off and missed the starting gun. Not to be out done, I got to work and typed a measly three hundred words before I konked out again. I would do better the next day I promised myself. Day two I posted just over a thousand words, not great, but better than the first day. Then I hit the brick wall. Did I mention that I am a pantser? My method is to come up with an idea, characters and let the rest grow organically. I’ve tried to plot out a story, really I have. But my problem with that is that once my creative sides knows how the story ends it loses interest. Being a pantser isn’t a problem until I hit a point where my intellect kicks in and says, “hold on there, that won’t work.” Yep, screeching hault. My creative side is very intimidated by my intellectual side. It sulks, it pouts and it refuses to write. So, until my analytical/intellectual mind solves the problem in the plot I flounder. That is just the fix I found myself in. I had a important, but secondary character, around whom the major conflict revolved. This character had placed himself in major jeopardy. The good guys, hero and heroine, of course must save this hapless character. That’s all well and good, says A/I, but the bad guys will just off this dude and get on with business. A/I was right of course. There had to be a reason for them not to off the character before the guys in the white hats arrived. Did I mention that brick wall? Now being a teacher has certain advantages. I bounced my problem off one of my most creative, intellectural students. The answer, “that’s simple Mrs. F, they would want to use him for…. Genius, the answer had been there in front of me all the time. Now I’m off and running again, sadly a week behind, but still hoping to win NaNoWriMo! What’s your story? This story will be my second romantic suspense novel and I have an editor waiting for it! I need another of these to decorate my wall! I want to remind everyone that if you are age 50 or older you can get the vaccine for Shingles. Go today, and get your doctor to give you the vaccine. Why you ask? Because having Shingles is torture. I would not wish them on my worst enemy. I came down with Shingles the last of September and still have twinges of pain in my face. My right eye has shooting pains, my upper jaw hurts, the spots on my face where the blisters were are still painful. Take thee to thy doctor today! Enough of the whining. Now on to more interesting topics. A Matter of Trust has been out for just over a month and has been doing well. It has earned seven 5 star reviews. Two from bestselling authors. Have you check it out? No? What are you waiting for?